You ever have one of those nights where you’ve almost fallen asleep for the night but then an idea hits you like a ton of bricks and you begin to work the concept and solutions in your head? Yes. I do that. A lot. D’oh! So I’m laying down and this idea hits me about my luggage rack storage area and the GoWesty Vanobag that came with Libby (my 1987 VW Vanagon Westfalia) when I bought her last summer. I’ve always avoided using it because I wasn’t a fan of flimsy light weight tie down straps it came with. Sure I could have bought better ones but that wouldn’t solve the security issue that is also a big concern of mine. Of course, I wouldn’t be keeping anything of real value up there but still I wouldn’t want it stolen as I stopped into Wal-Mart for some supplies on the way to the woods. Maybe use it to store my fold up chairs, my BusDepot EZY Awning Plus and my RV mat. These are the products described in this Review. 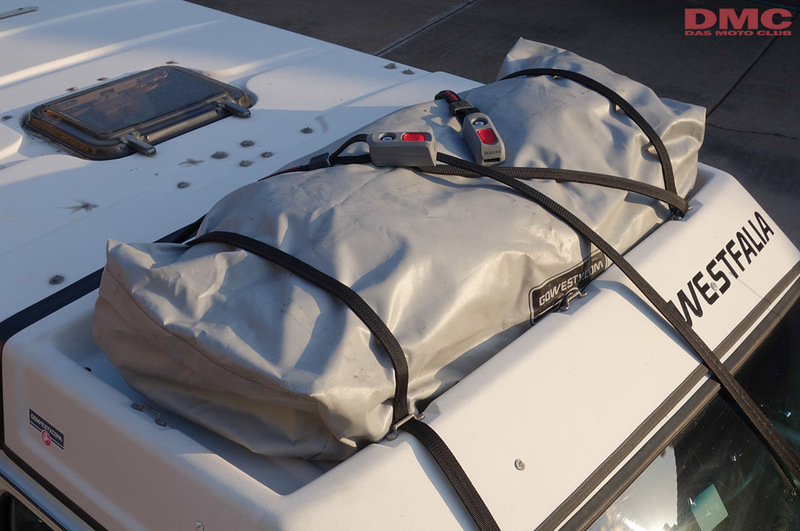 I have the first generation of the GoWesty Vanobag and you can see how the tie down straps are small and yes they do the job but not to my satisfaction. Plus, a quick unbuckle or a swipe of a pocket knife and that bag would be in someone else’s possession very quickly. Here comes the idea that hit me… Yakima makes a product named the Ripcord which is a heavy duty cargo strap but what makes this guy different is that the thick nylon strap actually houses a steel cable PLUS the buckle locks for added security! Bingo! I ordered a pair of straps as a kit off of Amazon for $68 and free shipping. 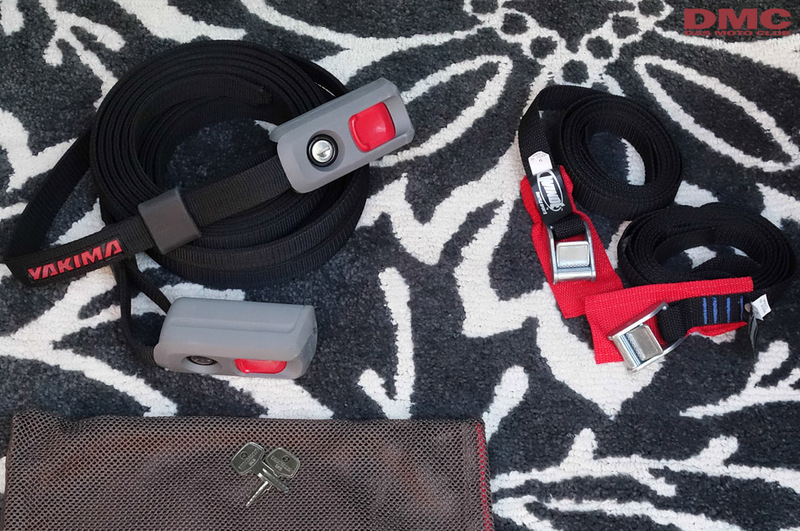 The kit came with two 12ft long locking straps, two matching keys and a carrying bag. One single key will lock/unlock both of the straps and Yakima is very good at having tons of key codes out there so say for instance my key for my strap won’t unlock your strap. As soon as the UPS man dropped them off I was off to see if the layout and ideas I thought of a couple of nights before would actually work. So with my Vanobag filled with items I threaded the two Yakima Ripcord as shown through the stock tie down cleats. I tried getting away with just one strap but it just wasn’t quite long enough for how I wanted to route the heavy duty strap so I resorted to using both. I wanted a criss cross layout as shown and the thing to keep in mind is that the tail of Strap A will be inserted into the head of Strap B. Then the tail of Strap B will be inserted into the head of Strap A. I know that sounds confusing but take a look at the photos and it’ll make sense. 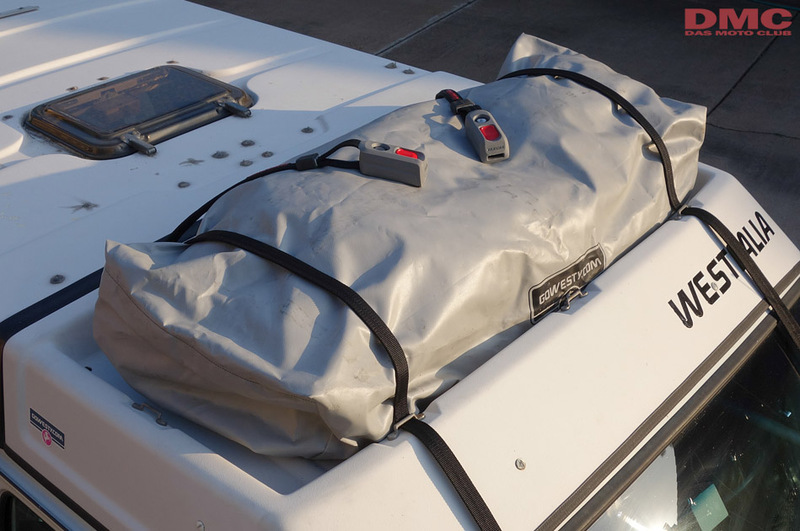 Once both are in place pull on the ends of both strap separately while pressing the red button on the locking mechanism and cinch up those strap nice and taught so your cargo is completely secured. 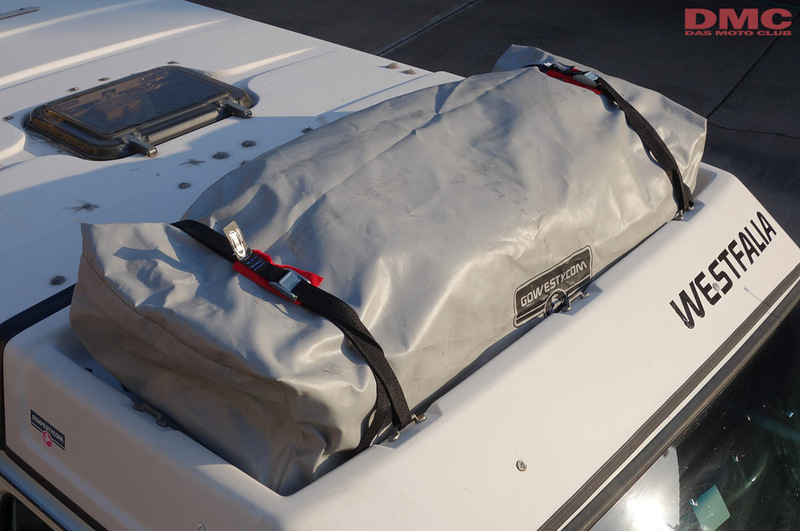 Now just tuck the excess lose end underneath the Vanobag and lock both locking mechanisms and you’re good to go! Now this is a secure solution I can live with! 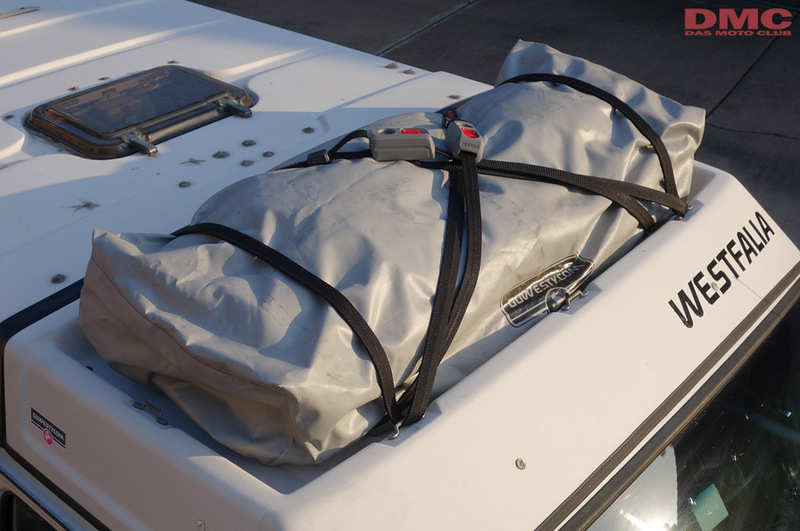 I will definitely be using this upper area for storage on my future camping trips since the new Yakima Ripcord gives me not only the strength I required but the added security of the steel cable and locking buckle system. This is a great solution if you're like me and often worried about the security of your items tied down on the exterior of your van. I found nothing that could be improved upon and that's a rarity. I highly recommend it. 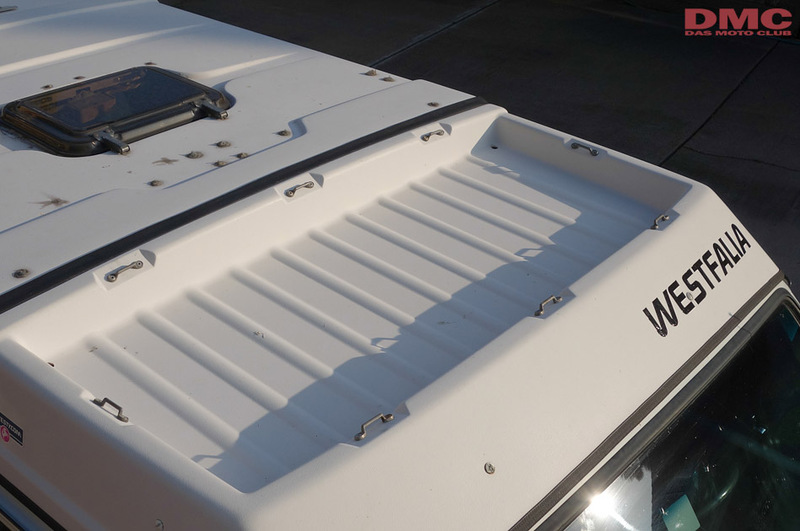 Gowesty specializes in after market Vanagon parts, and they have a nice selection. Their extensive selection of Youtube vides are helpful too. However, I find them very overpriced. For example, a Vanagon 12 volt replacement refrigerator cooling fan they sell for $19.95 can be had almost anywhere online for $11.95. They also charge much more for shipping than their competitors do. So, you “pay” for it. Also, be aware they have extremely restrictive return/exchange policies which might stick you with something you thought you needed, but really didn’t. They rarely accept returns and customer service complaints get trashed. So, just be careful with Gowesty. That’s all.